Are you in a breakfast rut and need inspiration for the most important meal of the day? Or maybe you are looking for new ways to use your spiralizer? Then this recipe for crispy sweet potato waffles with blueberries has got your back. It also happens to be vegetarian and gluten free. This dish is kind of like the sweet potato version of latkes. Spiralizing the sweet potatoes is so much easier than using a box grater. Oh, and we just thought of a third niche this recipe fills: If you're looking to justify having a waffle iron because someone is complaining that it's just taking up space in the kitchen. Well, here you go! To save time and hassle in the morning, you could make the sweet potato waffles through step 3. Keep the sweet potato strands in the refrigerator overnight then proceed with step 4. Bam! You just shaved off at least 10 minutes of prep time. Per Serving: 199 calories; 9g fat; 26.8g carbohydrates; 5g protein; 108mg cholesterol; 103mg sodium. Wasn't a big fan of the flavor balance or texture. I followed the recipe to the t but was sadly disappointed. I'd recommend a dash of salt and using small blueberries. Also, be sure that your sweet potato noodles are super cooked before mixing in the egg and vanilla! 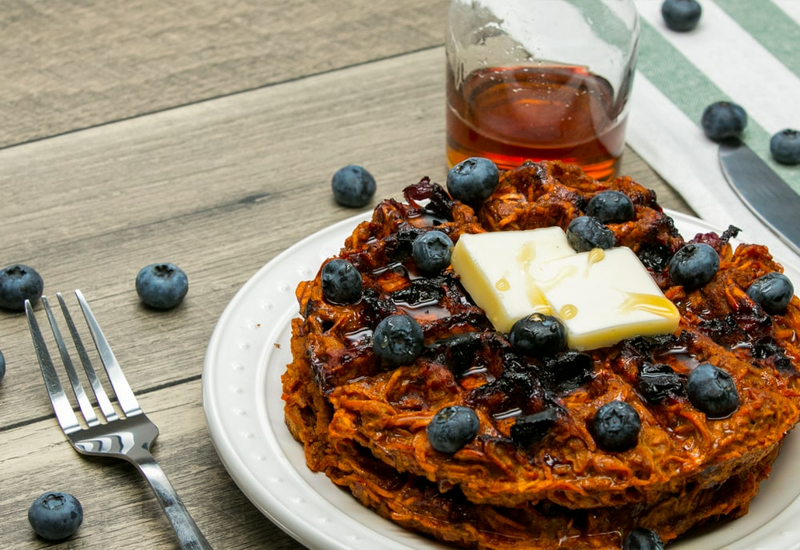 These reminded me of sweet potato hash browns with blueberries, in the shape of a waffle. With that said, it was really good and I will definitely make again. I don't have to feel bad about feeding these to my kids because it's healthier than store bought frozen waffles. These waffles are so good, I've made them twice already! Once with blueberries, and again with chocolate chips. Maybe next time I'll try them with banana?! Yum! This recipe was pretty good! I used frozen blueberries instead of fresh and had no problems. Next time I will try doubling the recipe to make more. Sweet potatoes are so versatile and this was a cool idea! I've had sweet potato waffles before, but this was my first time trying it with spiralized sweet potatoes. Not bad! I used frozen wild blueberries and they worked out nicely.